Am I an unlikely #fitspo source? Once upon a time, I would have said a resounding ‘yes’. But in the last 12 months, I have completely transformed the way I look at exercise. Me, who as a schoolgirl was always picked last for the teams during PE lessons. Me, who for many years even as a grown-up thought that exercise was something to be endured, never enjoyed. Thanks to my personal trainer, Matt, for his patience and belief in me as well as my own grit and determination I have discovered a love of pretty epic workouts, doing moves I never imagined. Not only have I gained physical strength and fitness, but working out is helping me manage my emotional wellbeing. It’s provided a boost to my self-esteem and self-confidence, and helping me love myself for who I am, to be my best self, rather than beat myself up for who I am not and try to be someone who I can never be. A little over 12 months ago I would have laughed at you if you had told me I would be doing – voluntarily, and with great enthusiasm! – the workouts I do now. I never would have believed I could have completed something like the Awesomeness Challenge. And I would have laughed even harder if you had told me that I would video these workouts, and post them on the internet, myself. Not only that, but that my body in those videos is not what I had long perceived as what fit people are ‘supposed’ to look like: lean and slim, with flat tummies and toned abs. But there you go. The world can be a funny old place, eh? It just goes to show that we all come in all shapes and sizes, and fitness does not fit one type of ideal that we see so often portrayed in the media. It shows that with grit and determination, you can achieve so much. It shows that with a bit of courage and bravery to post things online, you can help inspire others to be their best selves, too. Inspiration can come from the unlikeliest of places. 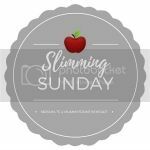 Hopping over from the #SlimmingSunday link-up, and this post has got me excited to read more of your blog. I think women like you are so inspiring!